Every day is Mother’s Day – Sha-pow! So. Today is Mother’s Day. I couldn’t go home to see my mom this weekend, because of BethyGirl2’s soccer game last night, and a project due on Monday morning. (By the way, she scored her first goal ever. Proud mommy am I.) It was just too hard to squeeze in 8 hours on the road. I know Mom understands, but I was pretty bummed about not seeing her. 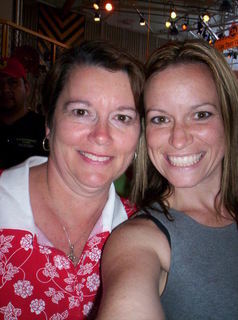 In my weird techygeekgirl way, I decided to change up my myspace a little… you know, change my default pic to a “Mom and me” pose… and then realized that as my song, I had Hot in Herre by Jenny Owen Youngs. Not exactly jiving with the mom/daughter theme, if you get my drift. I proceeded to embark on a wild goose chase through myspace music to try and find a song that even remotely had to do with motherhood and its virtues… of course, one with some essence of cool about it. Because that’s how I roll. Gah. too much coffee tonight, I can’t seem to stay on track. Here’s the song, and just in case you’re on your way to a fire and can’t take the time to watch the video, here are the lyrics. So. After watching and listening to the song, I really started thinking about how supportive my mom has been, not just in the past few years, which have been very tough, but throughout all of my strange, timid, geekorama existence. and supporting me in every single possible manner during the last 3 years, which have easily been the most character building of my 34 years of life. There is absolutely no way that I could repay what you’ve given me. Having you for a mom is a privilege and a blessing. I hope you have a very nice Mothers Day! I loved the video of you and the your girls. I need a blame my sister Tee shirt! You are lucky to have such great parents. And they are lucky to have you (and Bethy2)!